Hey, go buy some books from Women and Children First and help one of the last women’s bookstores in the country to stay open. Here’s Linda and Ann, the owners. How can you resist? Here’s an article about how the store’s struggling and needs more support. They have a good website, I just ordered a couple books I’ve been wanting. Thank you for the link! I was just thinking of indulging some long-standing book cravings, and I would much prefer to avoid the tentacles of the Medusa. I had no idea that an independent bookstore would or could stock such an amazing breadth of titles these days. All the best to you in these days of the blog wars. Don’t let us get you down – you have created a rare and wonderful thing, both in your books and in the community that you have made possible here. Thank you. Nice! Thanks, Alison… I’m forwarding the link to a few book buying mavens I know, in hopes of doing my bit to save the world from the banana belts of Bounders and Buns & Noodles. Wouldn’t it be wonderful if the store suddenly experienced orders from all over the country from loyal DTWOF fans? I bookmarked the page and will place an order just as soon as I can. I was wondering why I hadn’t yet ordered Fun Home when the rest of the world seems to have already read it. That will be my first order! Thanks for this! I live in Andersonville and can’t imagine life without this amazing bookstore. It’s worth a trip to Chicago just to see the store’s enormous purple awning which proclaims “Feminist Books and Music” in huge, defiant letters. Makes my heart happy every time I see it. Well done, Alison! Thank you. I love Women and Children First! Definitely order from them, and if you’re in Chicago get a membership! Thanks for reminding us (as if we could ever forget) the challenges small book shops (and feminist ones in particular) are facing. This is a great forum for that purpose. OK, I will start checking them first before other book distributors! I still miss Sisterwrite in Islington. Did anyone ever eat in the cafe upstairs, Sisterbite? With Jo Nesbit’s painting on the wall of two nuns, whose enormous skirts were the menu chalkboard? In my city we had a women’s bookstore that was next door to a (mainstream but cool) cafe. When the bookstore went under, they attributed it to the fact that women would browse in the bookstore with their dates, then go next door and spend their money on food in cafe. Sad but true. On the other hand, I once attracted about 60 women (memo to Auntie Soozie: I’m a girl) to a music gig at a very straight sort of sports/burger bar. At the end of the evening, someone asked the owner if he had done well that night. He said, “Not much on alcohol sales, but man, those women sure can eat!” Then he hired me for a 2nd gig. So I suppose it works both ways. Competition for scarce resources and all that. Yes,women’s bookstores (and other independents except Powell’s) are an endangered species. 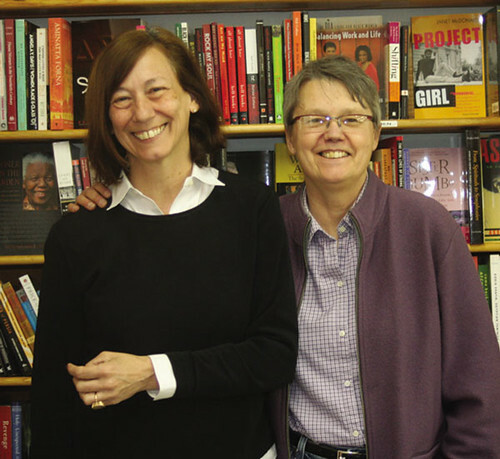 My next run will be to In Other Words,our feminist bookstore and resource center,here in Portland,OR. DeLand, I’ve been meaning to say for a while that I love your name! For all the non-Minnesotans, our state is known as the Land of 10,000 Lakes, thus the fun in the name. Hooray for independent bookstores! Amazon has a big sign on their window stating they can order any book, and they can! And totally unrelated to any thread anywhere on this blog, let’s all take a few moments to mourn and remember Mr. Vonnegut, who gave us so much wit and wisdom for so many years. What are people’s favorites of his? We also bought a couple books at a second-hand bookstore on the near north side which is apparently also really struggling. The owner was a woman who was friends with the sister of one of my friends who was there with me, who also used to have a bookstore up on Clark for Sci Fi — The Stars Our Destination. That turned into a basement home catelog business and then folded altogether. Ah, things seem to be getting back to normal around here. I’m a little sad. Threadgate was good entertainment value. So many posts and opinions. I could hit refresh when I was done and there would be more. I worked in an independant book store for over 20 years in noble poverty. Now all I want is to make enough money to have some leisure time instead, and still be able to afford books. DeLand…yeah, right next to Loring Park! Is Loring still the place for guys to cruise each other that it was in the ’80’s and early 90’s? And do you know if Amazon has a website? I remember the URL wars over the name back in the day. Huh, anyone know a lesbian author with a book to promote? Deena, Amazon isn’t on loring park anymore — we’re on 48th & Chicago in South Minneapolis. (Just had to get that out there because I work at Amazon & wouldn’t want you all to get lost). It warms my heart to see all the support for indie bookstores. Thanks, everyone. Thanks! I went surfing after I posted the first time and found you. I moved from the Twin Cities area in 1990, so my geographic knowledge is a bit dated. Y’all moved a lot south. I used to work very near to A Brother’s Touch at Nicollet and Franklin. I bet they’ve moved too. That neighborhood was starting to gentrify not long before I left. KURT VONNEGUT DIED?!?!?! Sorry to shout, but I really didn’t know (I’ve been holing up and writing my thesis [or avoiding writing my thesis] all this week, so I’ve been kind of out of the loop. How very sad. Especially since my sister goes to the University of Iowa for creative writing, and I guess that casual Vonnegut sightings were pretty much par for the course around there….My favorite has always been _Bluebeard_, I find it a very compelling portrait of what it means to be an artist (i.e., the constant self-doubt.) I liked _Deadeye Dick_ a lot, too. And thanks for the compliment! DeLandDeLakes is a nickname a friend from Kansas City gave me, and I liked it so much I kept it. The BAA is still planning to hold the Boston Marathon as usual, with extra sag wagons and emphasis on treating hypothermia. Meanwhile the weather mongers claim this will be the worst storm since, um, whatever, and we’ll all be murdered in our beds. Gah! My bookstore is in trouble?! I live down Clark Street from Women & Kids First, and buy all my books there. This Monday, I’ll be there to buy some more. Ginjoint, maybe I’ll see you there. I don’t live too far from W&CF either. I can’t even IMAGINE my neighborhood without it. What a wonderful place, and what wonderful owners too. Deland–the only reason I know about Vennegut is that it was on the Yahoo homepage. I had no idea he lived in Iowa–did he teach there? And sinacarus, thanks for the list of quotes! I haven’t read Vonnegut in ages, so I think a re-discovery is in order. judybusy~You’re welcome! Vonnegut did teach at the University of Iowa at one time. I don’t know if he had been teaching there recently, though. He’s definitely worth “rediscovering”. Vonnegut always reminded me of Twain with a twist. Both capable of wonderful observations of humanity with a dash of the sardonic and the ridiculous. Both started out in journalism as well. DelandDelakes~I second the emotion~Great name. Pam I – ah, yes, and Silver Moon, in the Charing Cross Road. RIP, Silver Moon. Silver Moon is still there – just moved to the top floor of Foyles across the road. I believe they are autonomous within the Foyles set-up. It was the only way they could survive the rent hikes by greedypig leaseholders along the CharingX Rd which are destroying more small shops than the Medusas do. Deena- Heh heh, no, they weren’t exactly shy, if you know what I mean. I figured I would look like an idiot if I turned and bolted, so I just kept walking. And to Judy and Sunicarus- I don’t think Vonnegut had been teaching in Iowa recently, but according to my sister folks still occasionally spotted him at the grocery store. 🙂 While we’re on the topic of independent bookstores, it’s worth mentioning that Iowa City has a few great ones that are still hangin’ on- Prarie Lights is great, and there’s another one whose name I can’t remember that is supposed to be haunted. I remember Silver Moon. So glad to hear it is still on Charing Cross above Foyle’s! Thanks for the update Pam I!! Deena, A Brother’s Touch moved down to Hennepin and 26th or so and then closed a few years ago. Jaibe, I love the Seminary Co-Op! It’s one of the best bookstores I’ve ever been to (though of course I won’t compare it to Powell’s in Portland). Chicago has a ton of wonderful independent and used bookstores. In addition to Women and Kids & SC, there’s Quimby’s, Shake Rattle and Read, The 57th St. Bookstore, Powell’s, a store called “Books” in lakeview, and that’s just getting started. Every one of them is vital and I’m sure appreciates your business! I work at Women and Children First and am in charge of doing online orders, I just wanted to say thank you to everybody for supporting us. There has been a ton of online orders over the last few days and it really means a lot to know that we have so much support coming from all over the country and we are so happy to be able to provide everybody with such great books! It’s because of you that women’s voices continue to be heard, thanks y’all! Sorry Pam and Jane, Silver Moon in Foyles has closed down – not sure how long ago. Their page page looks alive and has the Foyles address? Gay’s the Word, in London (UK) is also struggling. Alison did a signing there last time she was in the UK, I believe. It’s a lovely shop – it’s been open since 1979, but it’s still very clued up and vibrant. They have a ‘sponsor a shelf’ scheme – 100 quid is probably beyond most people’s grasp. But if anyone wants to bung them some cash and tell them it’s from a ‘Dykes to Watch Out For’ enthusiast, if we reach 70 quid I’ll top it up to 100 so we can claim the shelf of comics. Thanks for bringing this wonderful store to the attention of your fans Alison I bought my first autographed DTWOF book there many, many, years ago. I always stop in when I go back to visit in Chicago. hmmm…i just went to do some shopping at w&cf, and noticed that the site seems to be down. anyone know what’s up?